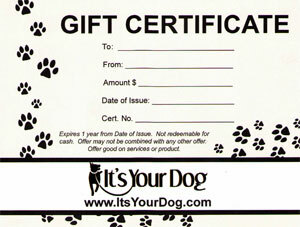 For special occasions and holidays, give the gift of training with IT’S YOUR DOG Gift Certificates. 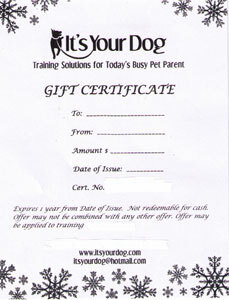 Gift certificates in the amount of your choosing are available for purchase and may be applied toward any training service. Certificates expire 1 year from Date of Issue, are not redeemable for cash and may not be combined with any other offer. Certificates will be shipped per your specifications thru U.S. Postal Service.